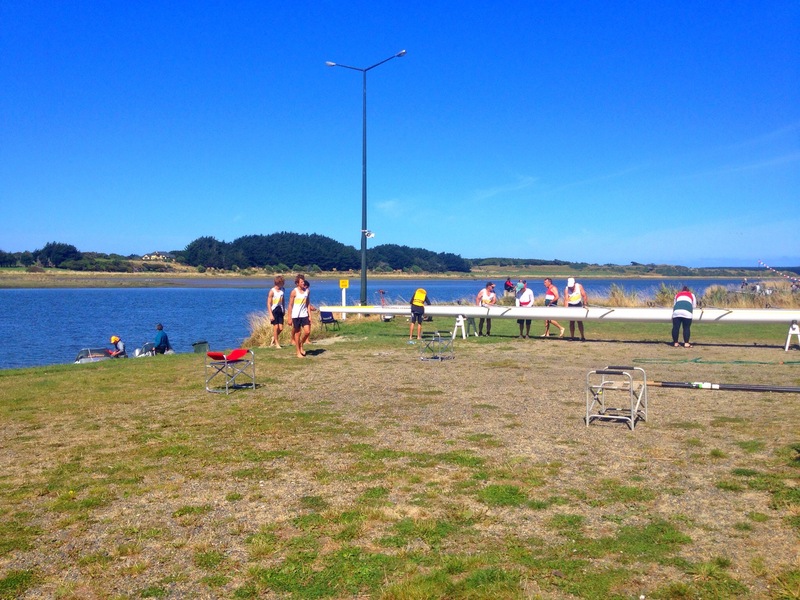 I knew that I had quite a few races today, but I wasn’t prepared for how close together they were: traditionally regattas involve a lot of sitting and waiting. Nope, not this one. I think it is because it was masters and juniors only, cutting out the as swathes of senior categories that we usually have to wait for. We were one crew member down for this one, so a new novice woman was thrown into the bow seat, much to her distaste! I’m not sure why though because you would hardly notice she was a novice at all! I was sitting at 3 seat, usually I’m 2. Apparently these two seats are the power seats. I didn’t think I had that much power compared to some of the masters! We drew lane 1, the tough lane, because it’s closest to the shortest route down the river, so everyone wants to be over there where you are. It’s also right next to the marked off channel for the boats to come down to the start, which is quite narrow. We did our own race, nice smooth start, the expected crew was off in front and we expected to be bringing up the rear. Instead. It was a really close race, one of the closest that I have been in for a long while. The boats that I could see were all almost neck and neck with us, and we were inching up on the one in the next lane. We kept going strong, doing our own thing, and found that we were ever so gradually catching them. We were side by side, just a nose in front of them as we approached half way. We put a spurt on, to see if we. Could get past. It was working, we were pulling away from them, but they weren’t letting us have it easily and were trying to push us over out of our lane. We stood our ground, we were now ahead, they almost collided with our sculls, but now it was their problem. The course boat as shouting at them to correct. That gave us the moment we needed to get fully clear and away. When we crossed the line we were pleased to discover we were third, and not that far behind one and two. Awesome work Sharon, for a novice!! I was rowing this race with mrs president. We have never rowed before and I haven’t been in a double for ages. We weren’t really concerned about the race, we just used it as a training session. I discovers here that I need to practice high intensity rowing when I’m out training. It’s so easy to let things go to pot when you’re busting your gut! Still, we did ok, fourth place, not last, nothing to grumble about. Somehow I got roped into an extra race. I actually that it would take place of my single, but sadly we got back just in time for me to dash to the shed, grab buster and row back down river again! This crew included a special Olympics rower, we have a strong adaptive crew at our club which is fab. It’s always a learning experience, is was no different, actually my first with an adaptive crew member. Despite it being a different race category. Since we were the only boat we were set off at the same time as the masters men’s fours. He sat behind me in bow, preferred quick short strokes and needed to be reminded to keep time with the other blades, as he kept getting out of time and tangling his sculls in mine. He listened well though, once I knew he needed regular calls to remind him, and had worked out that I needed to shorten my stroke down to 1/2-3/4 to match his. With that and also keeping an eye on the course (usually bow seats job) it was a busy old race! Still, he did fab, we did fab, and managed to come in ahead of some of the men’s fours that we were set off with. Great work guys! I am so not ready for being a masters singles rower! I need more practice in the novice category! This is only my third singles race ever. My first was the South Island masters (which, to my amazement, I won!) my second was a local regatta at our club a month ago, in which I was given a racing single that was simply not used to and over compensated in the steering, weaving all over the river! Today I had my old loyal favourite buster, which made me feel way happier. So it was still all about confidence in racing a single, steering the correct course and rowing long and strong. I didn’t row at the same intensity as I do in the other boats, I just upped the effort a little from my usual training pace. I wanted to be able to keep a reasonably good course, as that is something I have always found hard. My final aim was to row at a higher intensity in the single without crapping out and screwing up! I am proud to say I managed all three of these things. Row in a straight line: check! Keep good technique at a slightly higher intensity level: check! Result: 5th out of 5, but I feel much much better about this race than I have in the previous two. Baby steps! This is always something I feel more apprehensive about. That’s because it’s the thing we practice least in training, and rowing rather than sculling is quite different. I was still in 2 seat, but this was the opposite side to the one I usually row on: so I had a stroke side oar. Quick learning session to make sure my hands and knees all pass each other in the right places, as off we went. Steering a course in a four is harder, as two rowers have an oar atone side, and two have the other,so it relies on the people working much more as a team. Mrs President was in the bow seat shying instructions for steering to the rest of us, much appreciated. We had a tendency to drift right, so accidentally kept pushing upon other boats, oops! Were going good, making up ground on a boat just to our right, when on of our crew caught a couple of crabs, which gave the other host the inch that they needed. Never mind, we worked hard, did good, and corrected well. There’s always something to learn and take away from every race. 5th place I think. By this time I had been there all day long – almost 7 hours. The last race was the drawn 8. I bowed out at this stage and went home after the quad. Long old day for 5 rapid fire sprint effort races, with very little gap between! Enjoyable day, in sunshined and stayed calm all day long. ← Day 66: giveaway coaching offer – first 10 only!